The president is pledging $13 billion for a high speed rail system, but some experts fear it will never cover its own costs. President Obama is basing his high-speed rail project in large part on Europe's system. How will the economy fare in the second half of 2009? 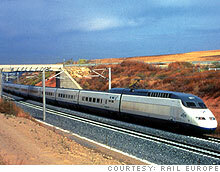 NEW YORK (CNNMoney.com) -- President Obama is pouring $13 billion into an ambitious high-speed rail project. Some say it will never make money. Some say it will. And still others say profit is not even the point. Obama's plan is "to jump-start a potential world-class passenger rail" in 10 major corridors, linking cities within the Northeast, California, Florida and other regions with "bullet trains" that exceed 110 miles per hour. State governments are in the process of applying for the federal funds. Sam Staley, director of urban growth and land-use policy at the Reason Foundation, a libertarian think-tank, said the project is risky, and that forecasts used to promote high-speed rail are "notoriously unreliable" because they "overestimate ridership and underestimate cost." California, the nation's most heavily populated state, is undergoing the most ambitious project: high-speed rail system that would link San Diego to San Francisco and Sacramento. Mehdi Morshed, executive director of the California High Speed Rail Authority, estimated that the San Francisco-to-Anaheim leg will cost $34 billion, nearly half of which would come from the federal government. Morshed believes it's worth every penny. In addition to creating hundreds of thousands of jobs, he says the high-speed rail will make money. "Once completed, revenues will exceed operating maintenance costs by over $1 billion per year," he forecasted. "It will make a profit." Nazih Haddad, staff director of the Florida Department of Transportation, also believes profitability is a possibility for a high-speed rail link between Miami, Tampa and Orlando. The Orlando-Tampa leg is expected to cost up to $2.4 billion, according to the state's estimates. "We're probably one of the only states around where we have conducted an investment grade ridership study," said Haddad. "Ridership proceeds would exceed operating maintenance cost." But Ron Utt, a railroad expert at the Heritage Foundation, a conservative think-tank, does not believe the incentive is enough for travelers to leave their cars at home. "It's not realistic at all because it's not competitive on price and it's not competitive on convenience," said Utt, referring to the Florida plan as an example of why high-speed rail wouldn't work financially. "I don't think it's got much to do with car culture. I think it's got to do with people making rational decisions with their money." Morshed believes detractors are confusing high-speed rail with traditional lines, which are slow and infrequent. "High-speed train services around the world make a profit while their transit and conventional services lose money, just like ours.."
Morshed points to Amtrak's Acela Express in the Northeast as a success story. The Northeast corridor, linking Washington, D.C. to Boston, is the nation's most highly developed high-speed rail service, according to the U.S. Department of Transportation. Most of it is controlled by Amtrak, a federally-funded railroad company that relies on government help, receiving more than $5 billion in federal appropriations and stimulus funds over the past three years, according to Amtrak spokesman Clifford Cole. Amtrak's high-speed rail, the Acela Express, is its strongest link: Ridership rose 6.5% to 3.3 million passengers during its 2008 fiscal year, according to Amtrak, while Acela revenue jumped 16% to $468 million during that time. Cole confirmed that the Acela unit is profitable, even though Amtrak as a whole is not. But when measuring Acela's profit, one has to take a new look at the old adage -- it takes money to make money. "It is a fact that no nationwide passenger rail system anywhere in the world is considered profitable when all costs -- including capital -- are accounted for," wrote Cole, in an e-mail to CNNMoney.com. "Like all national rail systems worldwide, Amtrak requires annual funding to support both its capital and operational needs." High-speed rail backers, including the White House, look overseas for success stories. But Amtrak released a study in April to demonstrate that Europe's system is heavily subsidized. Germany's high-speed rail network, the most expensive in Europe, required average annual subsidies of $11.6 billion during the 10-year span that ended in 2006, according to the Amtrak study. Japan's system is often cited as the most financially successful high-speed rail in the world, according to Ron Utt, but "that's because in the 1980s they wrote down all the debt to zero," he noted. "We're talking about several hundred billion dollars in debt." Sam Staley said it's possible for a well-designed high-speed rail to cover its operating costs, but even the best-run rail system won't be able to cover the capital costs stemming from its development. "I would really like to see high-speed rail work because I really like trains," he said. "I just have trouble getting over the fundamentals. These things shouldn't even move forward unless they can cover their operating costs." Otherwise, said Staley, high-speed rail could become "a black hole for government finance." But profit and loss are hardly the point, according to Vukan Vuchic, transportation professor at the University of Pennsylvania, who believes that high-speed rail -- like other transportation networks -- offers quality of life and is therefore worth the price. "Why do you build high-speed rail?" he asked. "Is it to make money? No. It is to provide public service. Cities that offer you decent choices in high-speed rail are better than those who only offer you highway."